Above: Preston Baker from Valudi Capital talks with two Expanded Horizons participants during the networking dinner. 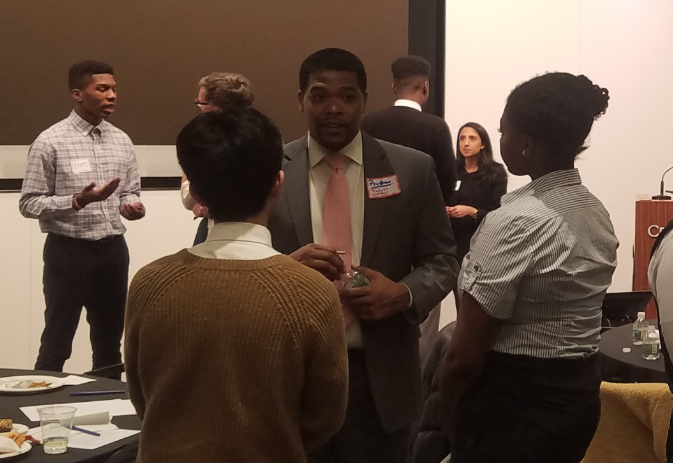 Participants in Henry Street’s Expanded Horizons college-success program did some extracurricular learning over their holiday break at the Settlement’s first student-professional networking event, hosted by staff of Credit Suisse on January 15. The energy in the room spilled into the second half of the evening, a networking dinner, attended by more than 20 volunteers, including a data analyst from Google, managers of Arlo Hotels and Hotel Rivington, a reporter from The Villager Newspaper, and financial services staff of PIMCO. “Our Expanded Horizons students learned a lot about various careers and how to navigate an ever-changing job market,” said Andrew Koskinen, college-success manager. “We could not have hosted such a great event without all of our wonderful volunteers; their passion for their own work was infectious.” He added that the Expanded Horizons students left with a number of great new professional contacts and a better sense of how to effectively network. The event—filled with conversation, laughter, and a lot of smiling faces—was fun for the volunteers, too. Said Jessica Patrick, a volunteer from Soho House, “Having everyone get up and out of their seats at dinner really got everyone talking, and the fact that there wasn’t too much direction made it truly feel like a networking event. Thanks to the volunteers from the following companies and offices, as well as a New York Times freelance photographer, who participated: Arlo Hotels, Bronx Lighthouse Charter School, Office of Councilmember Margaret Chin, Credit Suisse, Death & Co, Google, Hotel on Rivington, Mouse.org, PIMCO, Soho House, Solomon Studios, The Villager, and World Financial Group/Transamerica Financial.